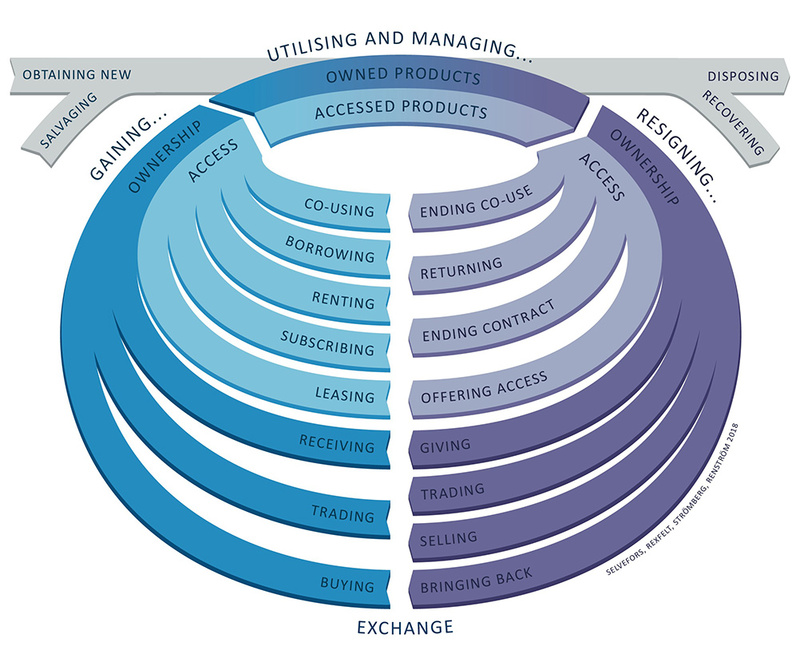 Products and services can be designed to enable and support circular consumption patterns through which people can circulate products from one user to another – from Use to Use. Much of the discussion regarding design opportunities related to circular economy is framed from a production and business perspective. The current narrative primarily focuses on opportunities to circulate resources from Cradle to Cradle or opportunities for circular business models. Even though innovations in production and business are essential for reducing resource throughput and for bringing about a transition to a circular economy, changes in consumption are equally important. In order to create preconditions for the circular economy, designers must consider how products and services can be designed so that they enable and facilitate circular consumption patterns, i.e. so that products can be circulated from Use to Use. To do so, designers must gain an understanding of what circular consumption entails for people and explore Use2Use design opportunities. When designing for Use2Use, gaining a thorough understanding of what circularity entails from a user perspective is fundamental. Considering the user in the circular economy should not only be about addressing people’s attitudes towards, and acceptance of, particular business models and design strategies, but to immerse in issues of consumption from a user perspective. Understanding the consumption process and the variety of circular consumption paths is crucial. The consumption process can be described as a three-parted process consisting of the phases obtainment, use, and riddance. In addition to buying new products and disposing of them as waste, people have many opportunities to obtain pre-used products and to rid themselves of products in a way so to that they can benefit a new user, see figure 1. In order to explore circular design opportunities it is crucial to gain an understanding of what these circular consumption paths may entail for people, especially in terms of which activities and other consequences the consumption paths involve. Adopting a new consumption path may afford users opportunities to engage in desirable activities, as well as be stripped of such opportunities. Users can also be forced to engage in undesirable activities, as well as be relieved from them. To gain an understanding of such aspects it is crucial that investigations to inform design work include in-depth user studies. Figure 1, Examples of circular consumption paths. There are many design strategies that can be applied to design for circular consumption. In order for people to be able to circulate products, they should be designed for longevity and durability, and enable product life extension activities such as repair and maintenance. One central design strategy is to enable and facilitate exchange between users, i.e. Design for Exchange, either by designing circular service offers or by designing products that directly facilitate exchange. For instance, products can be designed for exchange by making it easy for people to inspect and evaluate a product’s condition, completeness, and cleanliness prior to and during the exchange. In addition, designers can Design for Multiple Use-Cycles by ensuring a satisfying user experience not only for the first user, but also for the second, the tenth or even the hundredth user. This strategy includes addressing the durability and attractiveness of a product for multiple users over time as well as questioning which user need(s) it is designed for. Products and services must be designed for detachment. Design them so that they are attractive to future users but also so that users will want to circulate the products to others. Designers can envision how people can be, for instance, supported to recognise when they no longer have a need for the product or supported to avoid forming emotional bonds to the product. Overall, a Use2Use perspective points to an enabling approach and comprises design opportunities to enable and facilitate the circulation of products from one user to another.